Today I bring you something nostalgic for Harry Potter's fans : a little default replacement that transforms your very evil witches into Death Eaters ! 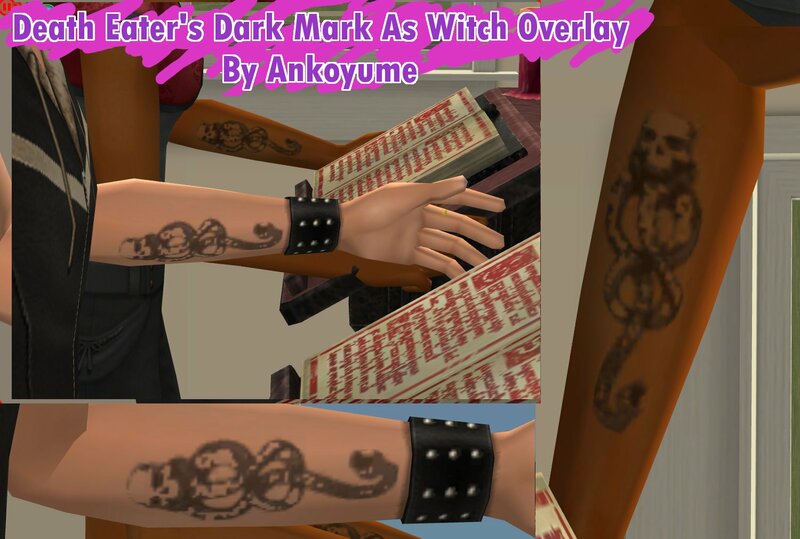 Actually, you won't get the whole outfit but you'll get better than that : the dark mark on the left arm ! It replaces the green overlay that you get when your sims become a very evil bad witch, by a not green at all skin overlay (you'll see the sim's genetical skin ! 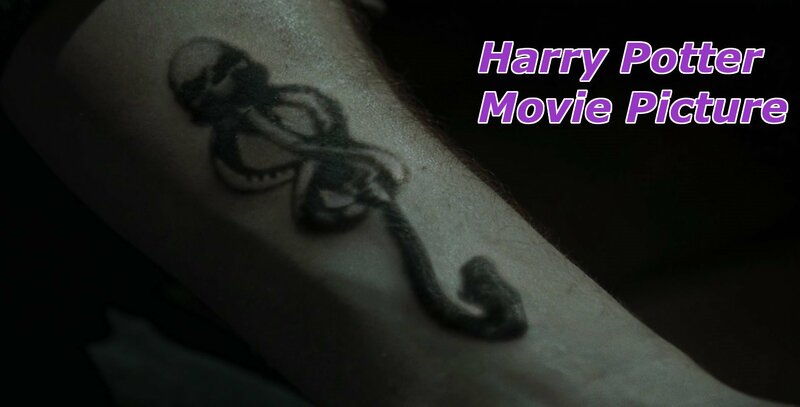 ), but with the Death Eaters' dark mark on the left arm. HystericalParoxysm had already made a good job, so I created an incomplete default replacement (only the body, not the face) : it's made to be used with HystericalParoxysm's mod "Normal Skin for Good and Evil Witches". Don't rename my package, otherwise it won't override the original mod. It works for all ages from teen to elder, and for both genders. 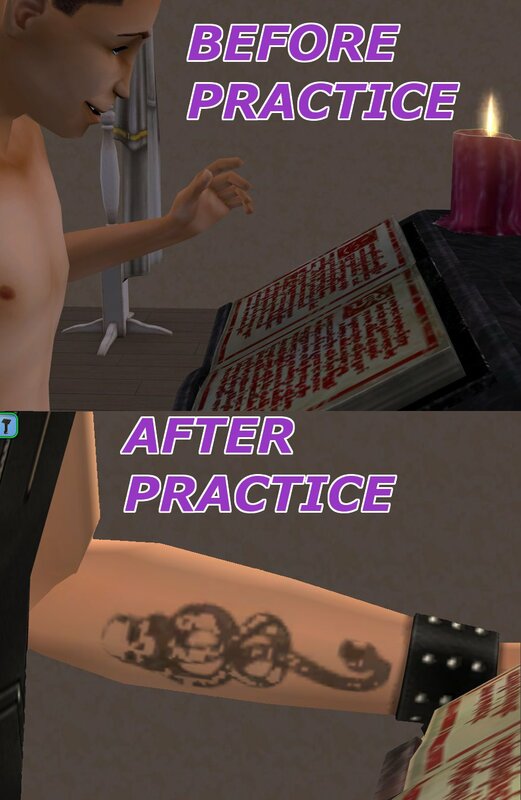 Remember your sims have to have a very bad balance for the mark to appear (So go practice "dark magic" in the spell book !). 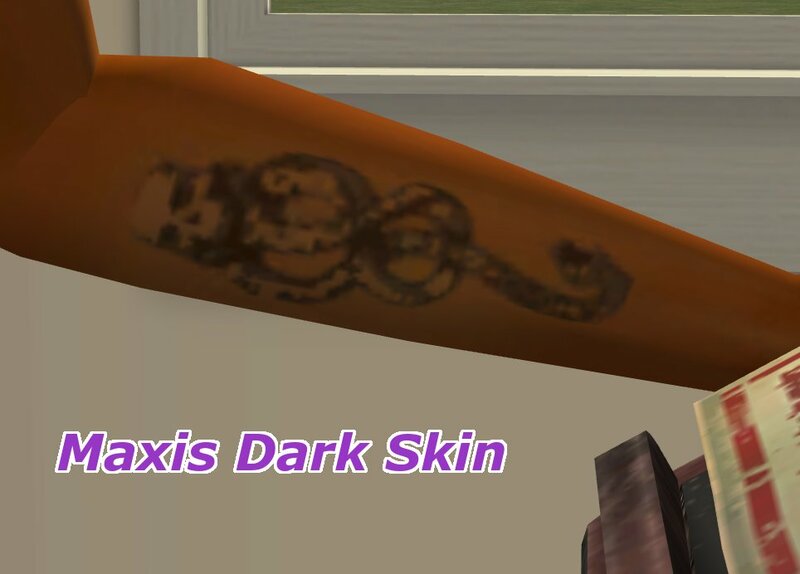 Conflicts : It will conflict with any other default for the bad witch skin that modifies the maxis TXTR file "afbodynakedwitch-bad" and the 6 maxis TXMT file "bodynakedwitch_bad". It won't damage your game or anything : actually, only the last default loaded (probably mine) will work. For instance, my mod will overrides those 7 files in HystericalParoxysm's mod, but will not override the face textures. BEWARE : When you first load the game, any existing bad witches will have the body textures changed, but not the faces (the green horror !). HystericalParoxysm explained very well how to fix it (see the link below). Apartment Life Expansion Pack & HystericalParoxysm's mod "Normal Skin for Good and Evil Witches"
Big thanks to HystericalParoxysm for the required mod and to JKR for her wonderful book. I used SimPE & GIMP, so thanks for the usefull softwares. Thanks to Lidiqnata who has been very patient with me, and to the ones that have commented on the Creator Feedback Forum thread. -Trick or Treat!- Halloween Costume Trunk! 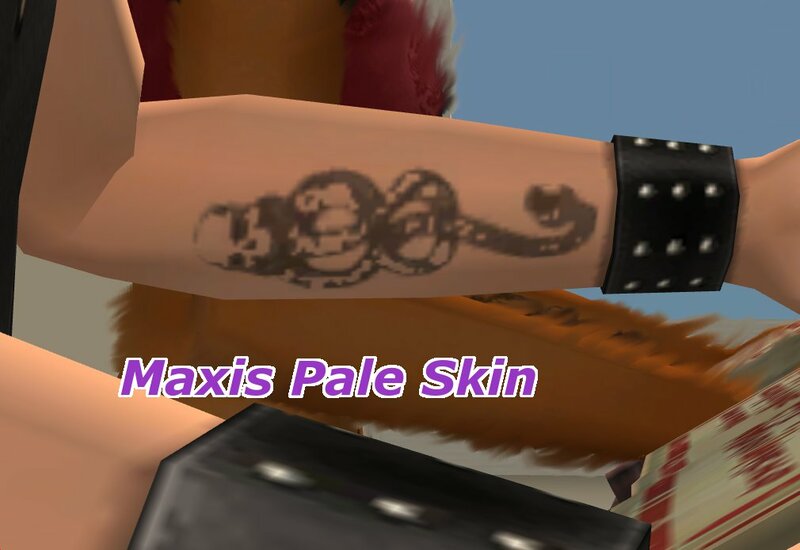 HystericalParoxysm's mod "Normal Skin for Good and Evil Witches"